Bridesmaid duty! Helping one of your besties get hitched is such an honor and fun experience. You have lots of duties as a bridesmaid: showers, dresses, shoes, getting the party started on the dance floor, shielding crazy family or ex-boyfriends from making a scene (jk!). But I think we can all agree, the number one duty of a bridesmaid is to share in your friend's joy and be fully present... unless she needs something and then you hightail it out of there and get said accoutrement! 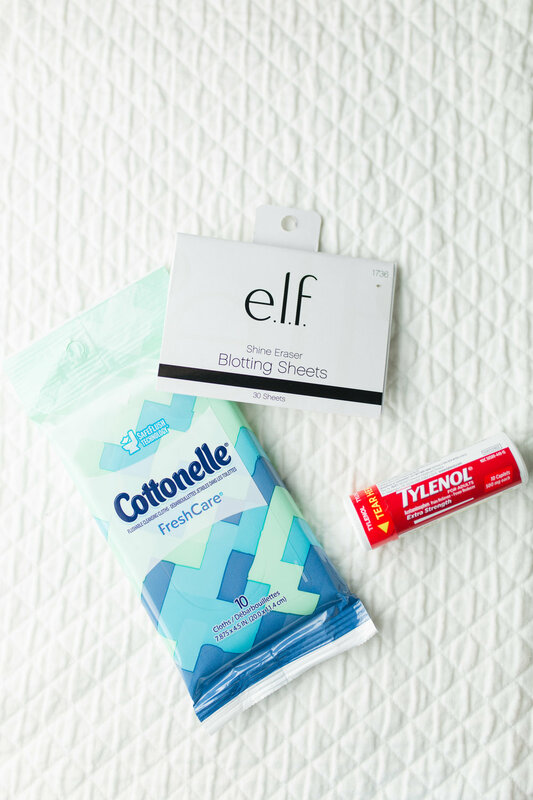 Enter the DIY Emergency Bridal Kit! Before Kelly's shower, I wanted to jazz up my target gift card. So I pulled together this inexpensive but fun kit of necessaries. It was a small bag, so it's really the bare minimum. It assumes that the bride has her own favorite make-ups on hand, but you have extra space in your kit bag, you might want to throw in some aquaphor lip repair, clear nail polish, a tampon, and sunscreen. Additionally, you will be an absolute rock star if you stock the getting ready room of your church or venue with bottled water and snacks that aren't messy! Here's what I was able to cram into this little "bag of tricks." Larabar because sometimes you don't have time to eat on your wedding day! Krazy glue for fingernails, busted zippers, fixing a rhinestone, broken heel, etc. toothbrush and toothpaste- it's surprisingly common how many brides forget to brush the morning of their wedding because they're so excited. Plus, if you eat bagels and lox, this will freshen your breath better than an altoid! blotting sheets to keep make up in place but refresh for portraits!